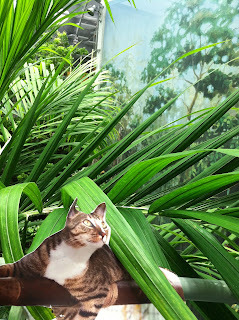 Me & Myself are feeling tropicatical. 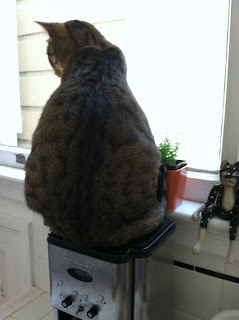 It's a hot Summer all over the Globe and some furiends are feeling like a "Cat On A Hot Tin Roof". Let's chill with the thrill of laughter cuz laughing is definicatically the bestest stuff on da Planet, and it might bring da body temps down to Sea Level, then weeza all feels cooler. Doggone it - everybody should have an indoor shwimming pool like Gus, and I always has my Guido Speedo ready for a quick cooling dip! I mean GO GREEN and itza could cool us all down all over da Globe. Itza cool to sneak a green but catOstrophic if theyza not tasty. 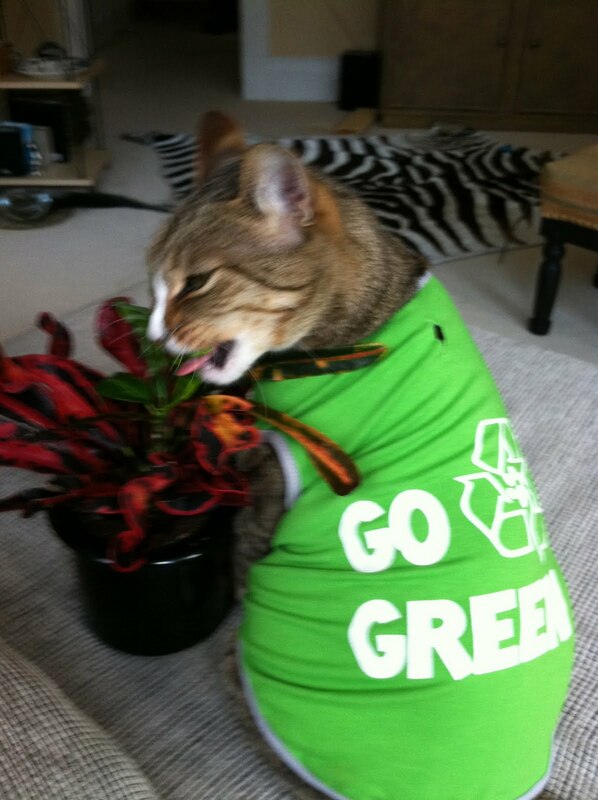 Public Services Meowsage: Go Organicat Green, and don't get mean but I mean to tells you to be happy like my brofur Yolo is! All thanks to CATCHING LIZARDS Handmade Pet Products and theyza got toys fur da feline furs and da doggone great pooches AND sparkling preshus stone jewels too! 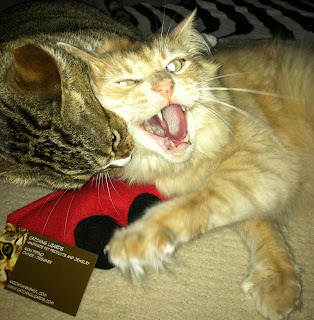 Be shure youza tells the deeziner, my furiend Mimi Pipino, dat youza FOG "Friend of Guido" and sheeza deezines something Catzowey fur you! Sheeza cool, yep uh huh itza fur shure. Are you feeling more cool? I wishes you the mostest meowvalous nonCATastrophic week. 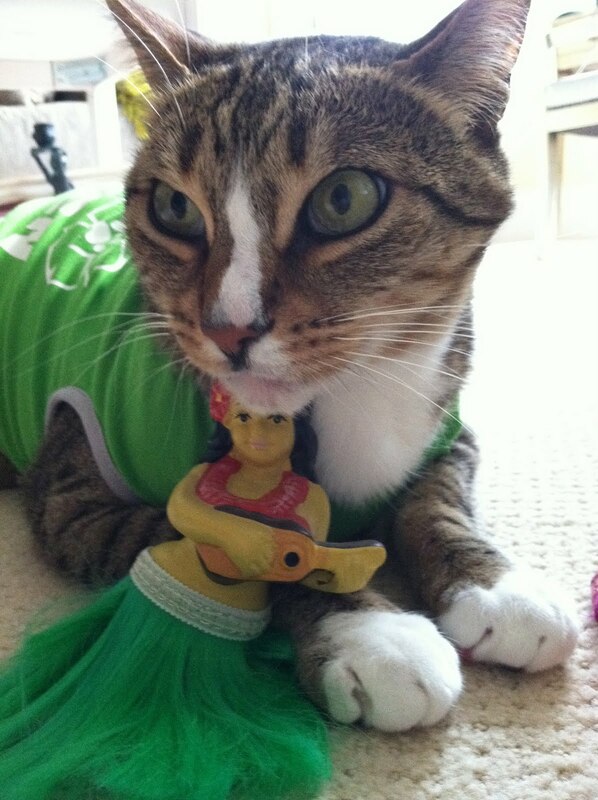 Definicatically, you've heard of Global Warming - it's warming uppa the Globe, and my Envirokitty self izza concerned about that. Yep Uh Huh, it never rains in CalEyeFurKneeYah and itza raining less in the Rain Forests. Fur shure these forests are hoomidity filled and can furizz yur fur. But definicatically, itza necessary to the Planet that we keeps da Rain Forests cuz many critters likes hanging out in dem, and theyza calls the Rain Forests 'home sweet hot home'. 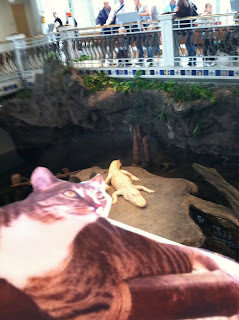 Every now and then youza gonna come around da bend in a Rain Forest and meet someone different, like a lounging Gator. 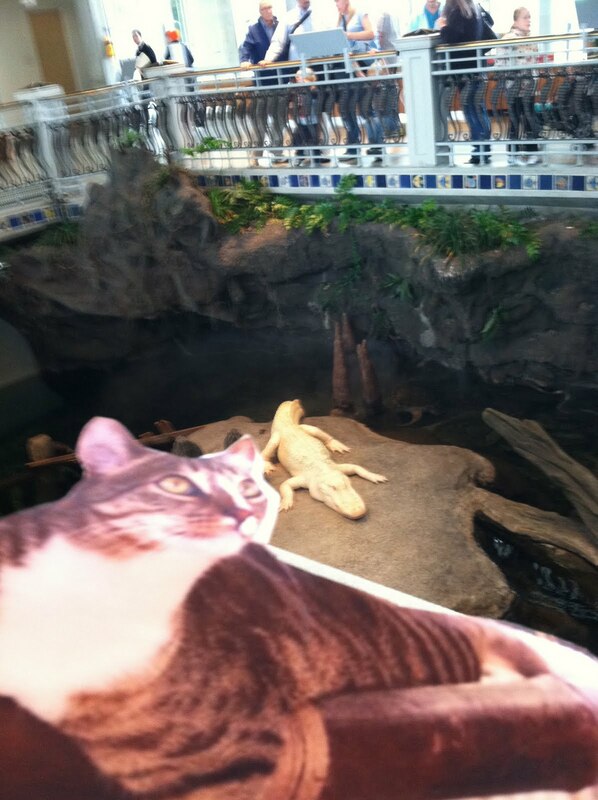 I didn't say see youza later alligator, but I did decide to lounge around with da great albino Gator named Claude. Itza meowvalous heeza not named Alli! Pssst ... heeza thinks I don't see him! But he duzn't really see me cuz heeza albino gator. 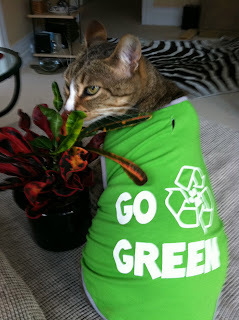 I'm not feline fooling around whenza I says the Rain Forests just izn't fur 4-leggeds. 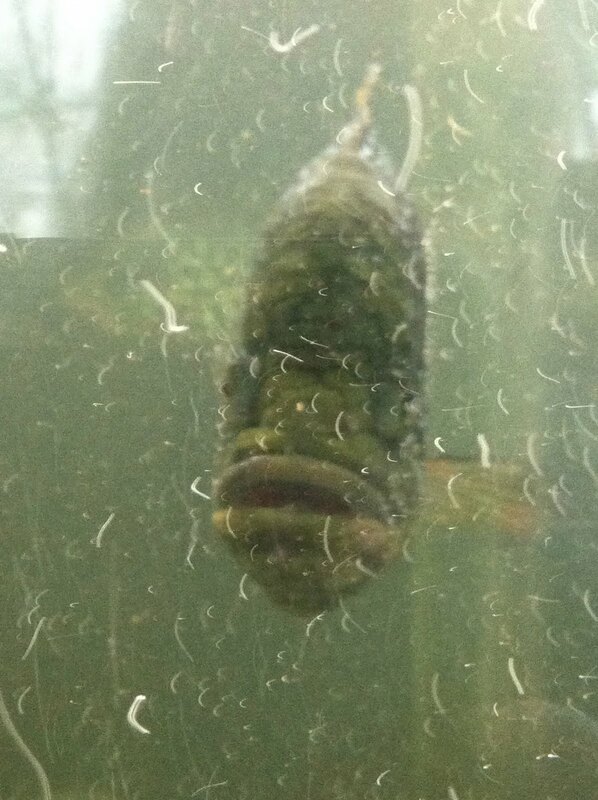 Fur shure everyone lives in that Rain Forrest on land and in water too. 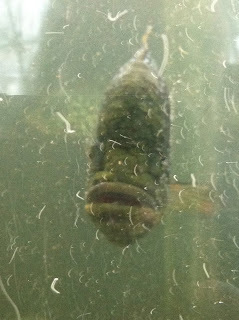 My pal Ferdinand da Fish whooza little fishy (but hey, even though he's not a catfish he's meowvalous) luvs his foto taken with my underwater cam. 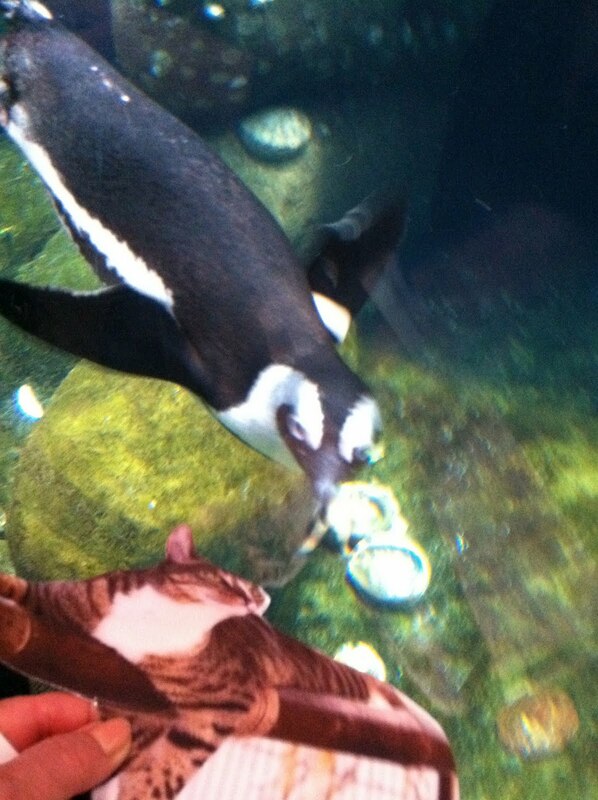 Imagine Me & Myself meeting and greeting the Penguins whooza curious as a cat about me showing up down under. I thinks this one is wondering where my Guido Speedo is! Quzzicatical me wonders if youza purrpondering about learning more bout flying fishies, abnormal florals, purrhaps penguins or a great gator or two. Traveling and unraveling in the Rain Forrest often makes me exhausticatted! There are wheel barrows, wine barrels, water barrels and barrels of fun but Me & Myself are more inclined to barrel down the Streets of San Franfuncisco, cruising in my CatOlac convertible. Nothing wiggles my whiskers more than the famoso San Fran Fog frizzing my fur and Fog keeps me cool during Sum Sum Summertini time in San Franfuncisco. 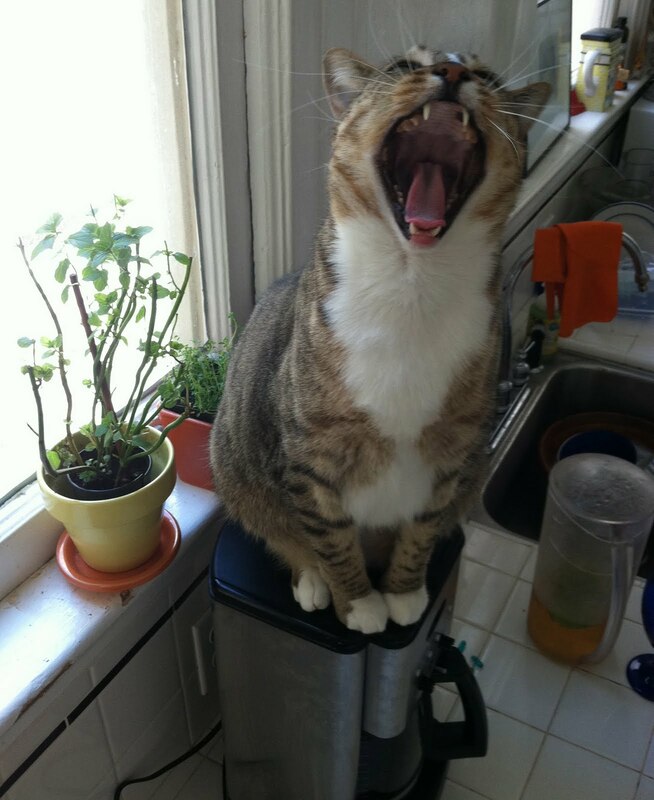 Itza fur shure, always before I hop into my CatOlac convertible, I gotta wake uppa the neighbors - hey can youza all hear me saying "Buon Giorno, it's a meowvalous day in the City by the Bay"! Leave it tooza the Purrisians to have the mostest meowvalous French Press Coffee maker and here I am pressing my Furench masheen EyeTailYun style. Catzowey I feel a double Meow-spresso coming uppa! Good morning World! Once the Catfeine is working and youza driving with me in my CatOlac convertible down da coast seeing da sites and site seeing, in true EyeTailYun fashun, weeza gonna stop at a cool cafe for something refureshing - a bottle of Purrrseco duz it fur me! Weeza gotta keep our energy up and stop for some sweets on da road trip. Didja ever have Pomegranate & Champagne cuppie cakies? Theyza absoluticatically deelishus and probably filled with all da Omega Vitaminis cuz the cuppie cakies got Pomegranate inside - hmmmzatini I thinks Pomegranate is called da 'homely old fruit that's not winning any produce aisle beauty contests. Let's take pity on da poor Pomegranate! Holy Cannoli I knew I shouldn't have had that extra cuppie cakie! I can barely fits into my new deeziner CommandoCat vest! Itza pooch size Medium and I'ma sucking it in for this foto. 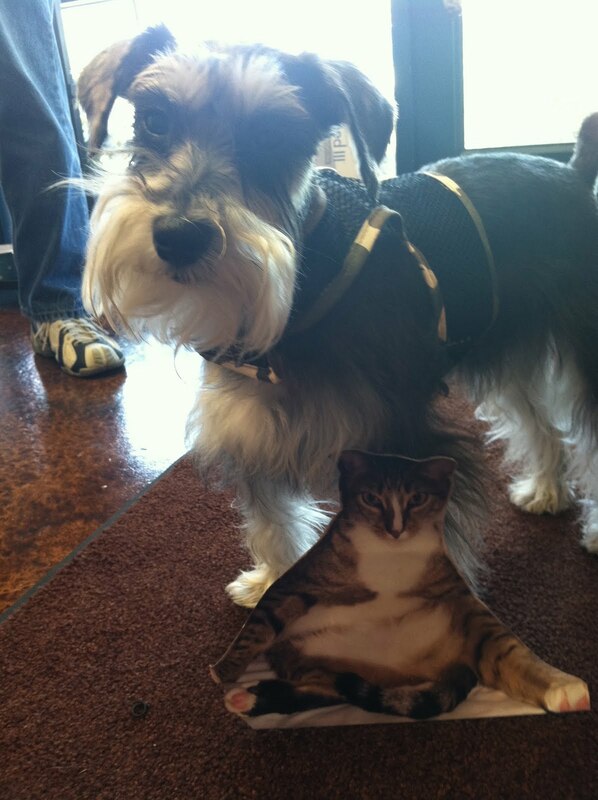 My purrsonal shopper found a doggone great boutique "The Doggie Bag" in Granite Bay, CalEyeFurKneeYah and Signore Ammirato owns it. Hey heeza my fellow EyeTailYun so youza knows heeza catzowey! 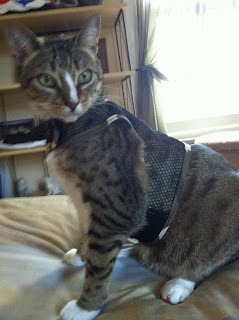 Jessie is "The Doggie Bag" boutique model and sheeza trying out my new Deeziner vest and not ecstaticat bout being a meowster model! I thinks sheeza looking funtasticat in my new jacket! Hey! I wishes you da mostest nonCATastrophic week and if youza ever seeing hues of blues, youza just reach out and pawmail me cuz I'ma always ecstaticat to hear from you & yurself.